This year we are excited to announce that our user conference is in Vegas as part of the Office Tools Pro Accelerate Pre-Con. June 21-23 at Bally’s Las Vegas. During the Pre-Con and main conference, you will be able to meet with Senior VP – Josh Clark, VP of Sales and Marketing – Jim Torpey, Sales Engineer – Jesse Dewald, or Account Manager – Mary Meza, to discuss your cloud. 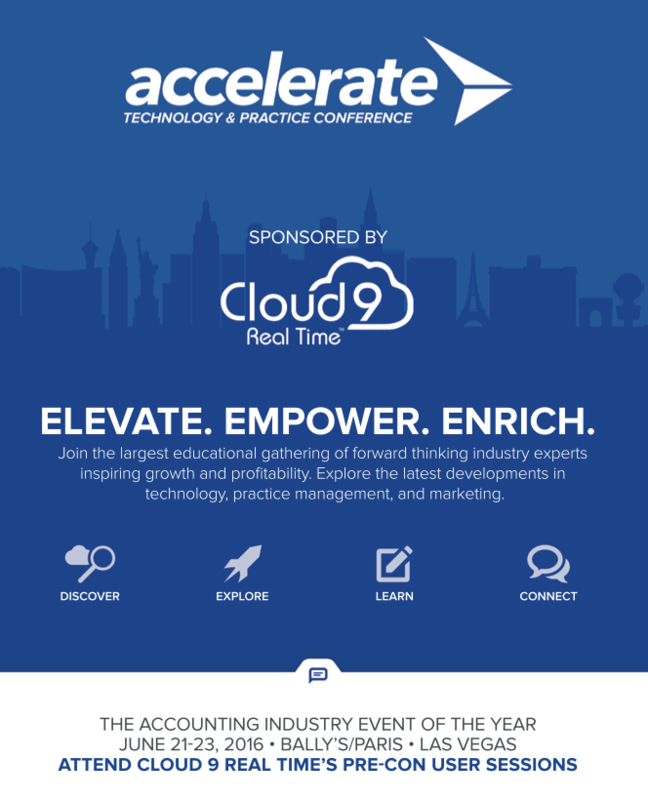 At Accelerate’s Main Conference you will be able to earn up to 18 CPE credits. This conference is designed to help firms engage with new technology, marketing concepts, and best practices. Join Cloud9 and many additional thought leaders who will be presenting and participating in roundtable discussions. In addition to the conference, Jesse Dewald, one of our sales engineers, will be on site to help with any questions or support with your environment. You can reserve one on one time with us in the training resource center. Our very own Josh Clark will be making a keynote speech discussing his experience as a marketplace leader, public speaker, and Advanced Certified Life Planner to deliver powerful insights and the practical tools needed to find a better rhythm and build a richer life. We don’t have to settle for exhausted and empty. Each of us can have a clear vision of a brighter future, a vision audacious enough to intimidate us but authentic enough to invigorate us. Follow this link – http://www.officetools.com/products/conference/ – for more information and registration. Use discount code “Cloud9” for 20% off your total registration, $700 per person. Located at Bally’s in Las Vegas, rooms start at $89 plus taxes and fees per night. For more information, please contact your Account Manager or Cloud9 directly at (888)-869-0076.